Product #16607 | SKU ST3D116 | 0.0 (no ratings yet) Thanks for your rating! 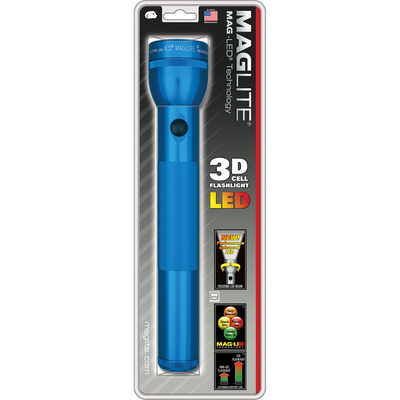 The Maglite LED 3-Cell D Flashlight combines MAG-LED technology with three D-cell battery power to provide you with a heavy duty flashlight that you can use for reliable, long range illumination. Along with a high brightness of 131 lumens, the ST3D116 offers a simple twist-top mechanism to adjust the beam from spot to flood. An intelligent battery management system ensures efficient battery usage by adjusting brightness levels according to available battery power. A push button design makes it easy to switch from constant to momentary on-off operation. This flashlight is manufactured with a rugged, machined aluminum casing, which along with an anodized corrosion resistant finish, in and out, ensures high durability at home and in the field. Furthermore, this flashlight has quality O-rings at both ends to prevent water ingress in the bulb and battery compartments. Power is supplied by 3 D alkaline batteries which last up to 72 hours.